Definition at line 24 of file ServiceGroups.h. Definition at line 30 of file ServiceGroups.h. Definition at line 27 of file ServiceGroups.h. Definition at line 31 of file ServiceGroups.h. Definition at line 29 of file ServiceGroups.h. Definition at line 21 of file ServiceGroups.cc. Definition at line 27 of file ServiceGroups.cc. Definition at line 127 of file ServiceGroups.cc. Referenced by checkUniqueness(), finalize(), findService(), and has(). Definition at line 101 of file ServiceGroups.cc. References at(), finalizeMsg(), has(), NULL, and p.
Referenced by finalize(), and has(). Definition at line 45 of file ServiceGroups.cc. References allServicesSame, String::append(), at(), checkUniqueness(), String::cut(), DBG_CRITICAL, DBG_IMPORTANT, debugs, finalizeMsg(), has(), HERE(), kind, method, Adaptation::methodNone, NULL, point, removedServices, services, and String::size(). Definition at line 118 of file ServiceGroups.cc. References DBG_CRITICAL, DBG_IMPORTANT, debugs, and kind. Referenced by checkUniqueness(), finalize(), and has(). Definition at line 200 of file ServiceGroups.cc. Definition at line 194 of file ServiceGroups.cc. Definition at line 141 of file ServiceGroups.cc. 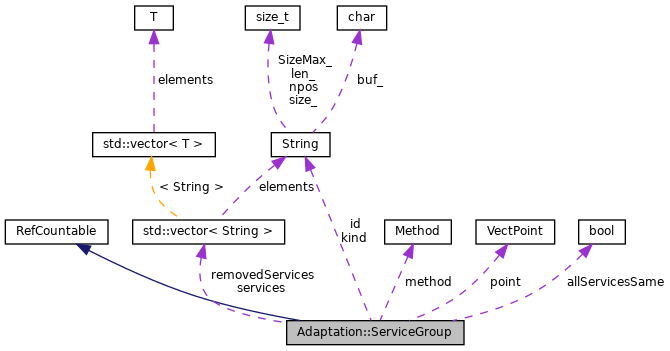 References allServicesSame, at(), debugs, has(), HERE(), Adaptation::ServiceFilter::method, method, Adaptation::ServiceFilter::point, and point. Referenced by findLink(), findReplacement(), has(), and wants(). Definition at line 45 of file ServiceGroups.h. References at(), checkUniqueness(), error(), finalizeMsg(), findLink(), findReplacement(), findService(), and services. Referenced by Adaptation::ServiceChain::advance(), checkUniqueness(), finalize(), findService(), and Adaptation::ServiceSet::replace(). Definition at line 32 of file ServiceGroups.cc. References i, ConfigParser::NextToken(), NULL, ConfigParser::ParseWordList(), services, and wordlistDestroy(). Definition at line 134 of file ServiceGroups.cc. Definition at line 32 of file ServiceGroups.h. Definition at line 73 of file ServiceGroups.h. Referenced by finalize(), findLink(), findReplacement(), and findService(). Definition at line 66 of file ServiceGroups.h. Definition at line 65 of file ServiceGroups.h. Referenced by Adaptation::DynamicServiceChain::DynamicServiceChain(), finalize(), and finalizeMsg(). Definition at line 70 of file ServiceGroups.h. Referenced by Adaptation::DynamicServiceChain::DynamicServiceChain(), finalize(), and findService(). Definition at line 71 of file ServiceGroups.h. Definition at line 68 of file ServiceGroups.h. Definition at line 67 of file ServiceGroups.h. Referenced by at(), Adaptation::DynamicServiceChain::DynamicServiceChain(), finalize(), has(), parse(), and Adaptation::SingleService::SingleService().